ON MONDAY, March 18, the Filipino Academy of Movie Arts and Sciences (Famas) finally released their full list of films, filmmakers, and actors that made it to the list of nominations for the 67th Famas Awards. Under the short film category, three films made by Dabawenyos made it to the list: (1) Siyudad sa Bulawan (City of Gold) by Jarell Serencio; (2) Pulangui by Bagane Fiola; and (3) Sa Among Agwat (In Between Spaces) by Don Senoc. Serencio’s Siyudad sa Bulawan is a story of three brothers needing cash and who took a job in the gold mines of Mt. Diwalwal without realizing the danger that awaits them. The short film, which was the springboard of his first full-length film Diwata, recently won in CineFilipino 2018 as the 2nd Best Short Film – Open Category. It also won Best Film at the 1st Palawan International Film Festival. Fiola’s Palangui, on the other hand, is a story of two brothers on two flourishing Moro communities separated by a vast river. They both feel a longing “beyond the grasp of their content and idyll life.” In order to find peace, the brothers sought the river. 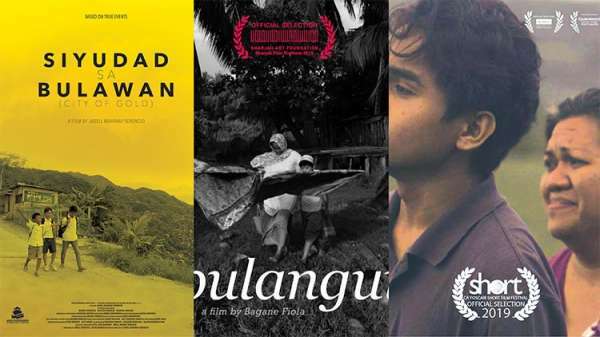 Pulangui was awarded the Best Film Award and the Best Sound Award in the 16th Mindanao Film Festival on December 10, 2018. Senoc’s Sa Among Agwat is a story of Jun, a farmer who lives in a pineapple field with his mother Dita and his brother Mako. His aunt from Manila, unable to have children, offers to adopt Mako with a promise to give him a better life. The story revolves around the separation and the gap between the two brothers. The short film is shortlisted for the international competition of the Ca’Foscari Short Film Festival IX in Venice Italy beginning March 20 until March 23, Saturday. Other entries that made it to the short film category were: (1) Baguio Address No.10 by Mervine Aquino; (2) Manila is full of Men named Boy by Stephen Lee; (3) ‘Wag Mo kong Kausapin (Please Stop Talking) by Josef Gacutan; (4) Gabi ng Kababalaghan (Mysteries of the Night) by Stephen Lopez; (5) Tembong (Connecting) by Shaira Advincula; (6) Balai (Home) by Klarisse Purugganan; and (7) Madugo ang Gabi by Alex Torres. The Famas Awards night will be on April 28 at the Meralco Theater.